Learn about the Wavefront AWS IAM Integration. The Amazon Web Services integration is full-featured implementation offering pre-defined dashboards and alert conditions and is fully configurable. From the Summary dashboard you can easily navigate to all other AWS dashboards. To create the alert, click the Create Alert link under the query and configure the alert properties (notification targets, condition checking frequency, etc.). 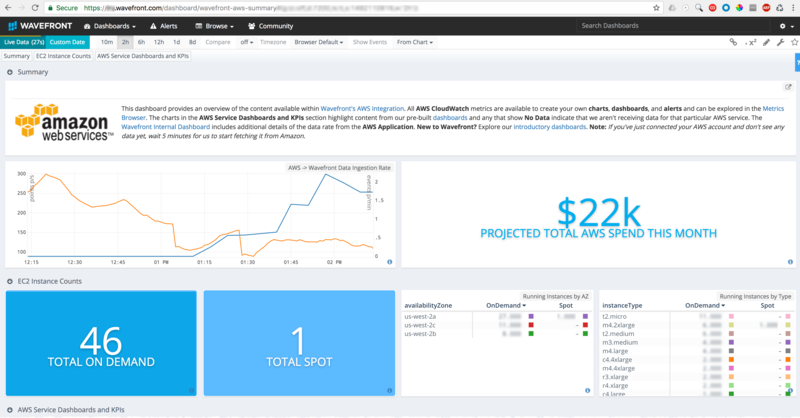 Wavefront ingests Amazon Web Services metrics using the CloudWatch, CloudTrail, and AWS service APIs. For details on the metrics and how to configure ingestion, see AWS Metrics Integration. Adding an Amazon cloud integration requires establishing a trust relationship between Amazon and Wavefront by sharing account IDs and an external ID. The external ID can be generated by Wavefront or by your company. To use an ID generated by Wavefront, click Set up Amazon Account to configure all integrations—CloudWatch, Cloudtrail, and AWS Metrics+—at once. To use an ID generated by your company, set up each integration individually. You start by granting Wavefront read-only access to your Amazon account or by giving Wavefront the permissions listed in AWS Metrics Integration.